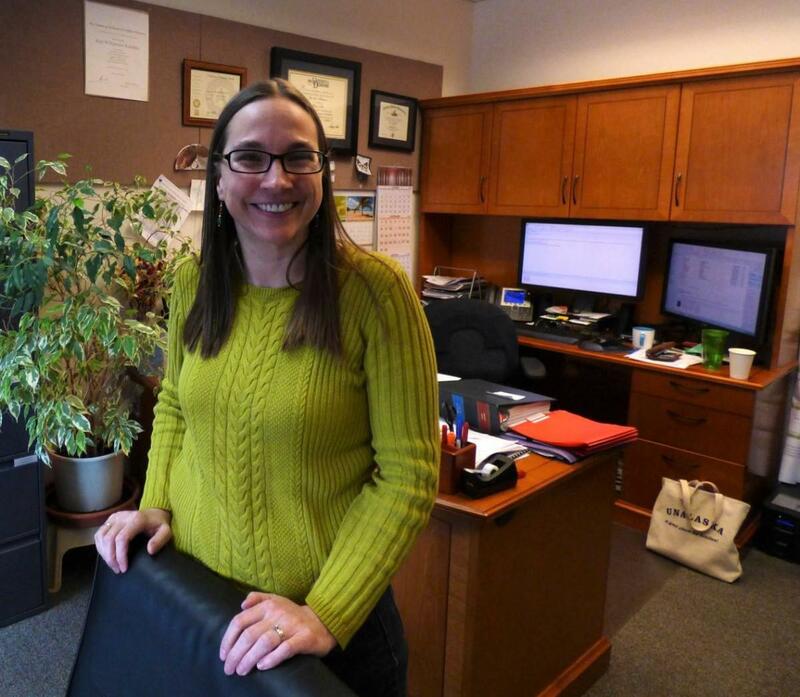 Erin Reinders, photographed in 2015 at her former office in Unalaska's Planning Department. She worked as planning director before her promotion to assistant city manager. The City Council wants Erin Reinders as Unalaska's next city manager. At a special meeting Thursday night, councilors heaped praise on Reinders — who currently works as assistant manager — before voting unanimously to start negotiations on a contract that'll promote her to the top job. "Erin is a real community member," said Vice Mayor Dennis Robinson. "Her interest is in this community, and she loves it. Her family loves it." Reinders has worked for the city since 2011 and was a finalist in the council's last two searches for a city manager. In 2015, she lost out to Dave Martinson, who resigned within two years over clashes with the mayor and council. In 2018, she lost out to current city manager Thomas E. Thomas, who resigned last week without stating a reason for his departure. "I'll be the first to say that I made a mistake the last time," said Robinson, referring councilors' unanimous decision to hire Thomas over Reinders. "But I think Erin will be really productive. I think our city will be well under her guidance, and I'm looking forward to it." The rest of the council echoed Robinson's confidence in Reinders' experience, as well as her ability to lead a smooth transition after Thomas' last day on May 31. "We have a policy at the city of trying to move people up through the ranks, and she has done that," said Councilor Roger Rowland. "She's actually served — at different times over the past few years, as city managers have been out of town — [as] acting city manager." Mayor Frank Kelty will negotiate the contract with Reinders, who was offered a job as Seward's city manager on the same day Thomas submitted his letter of resignation. Councilors did not address Reinders' other offer. But their decision to call a special meeting Thursday — two days after accepting Thomas' resignation — seems to have stemmed from their eagerness to keep her in Unalaska. "I look forward to trying to come to an agreement with Erin," said Kelty. "I'll work real hard on coming up with an agreement that council can support." Traveling on both personal and business leave, Reinders was not at the special meeting. In a Monday email responding to KUCB's inquiries about her Seward offer, she wrote, "Right now is certainly a time of discernment, both personally and professionally. No final decision has been made yet and there are a number of different things to consider." The Unalaska City Council has called a special meeting Thursday night. The only item on the agenda is an executive session entitled "Sole Source City Manager Position." The Unalaska City Council has accepted the resignation of City Manager Thomas E. Thomas — though it's still unclear why he's leaving the position. On Tuesday, councilors voted unanimously to amend Thomas' contract to keep him on the job through May 31 and then send him off with $20,000 in severance pay. Mayor Frank Kelty was the only person to comment on the resignation or severance package. Joining the council meeting by telephone, he spoke before the vote. City Manager Thomas E. Thomas has submitted his letter of resignation to the Unalaska City Council, which is expected to accept it at a meeting next week. The meeting's packet — made public Friday afternoon — includes Thomas' letter, submitted three days after councilors called a special session to discuss his contract and took no action. The former director of the city's planning department is now second in command at City Hall. On Thursday, Erin Reinders, AICP was named as Unalaska's new assistant city manager. By Friday afternoon, Reinders was acting city manager, after David Martinson left town for the holidays.